This HDMI to VGA Adapter is ideal for converting and transmitting digital signal from HDMI devices (Laptop, PC, DVD, TV Box,Nintendo Switch) to analog signal VGA devices (Monitors, Projects, TV),Support HD resolution, super clear picture, fast transmission speed. No other adapters needed. Gold plated plug is elegant and noncorrosive,improving the stability and speed of signal transmission. High quality guaranteed. This HDMI to VGA adapter cable supports resolution scale up to 1920 x 1080 (60Hz). It contains an built-in active HDMI to VGA converter chipset, no other adapters needed. 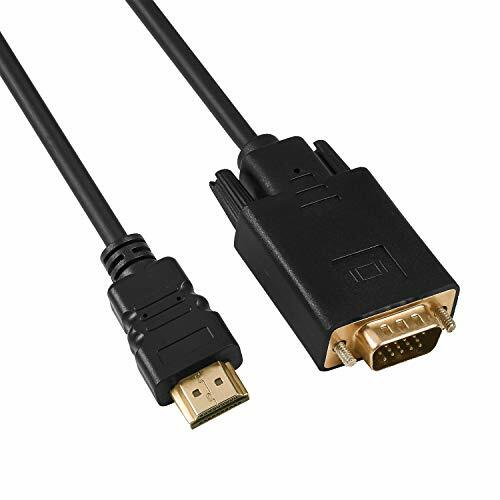 This HDMI to VGA cable is not a bi-directional cable adapter, you can only connect an HDMI output to a VGA input, and please note that VGA output does not support audio transmission. Anber-Tech provides 12-month Warranty to ensure long-time satisfaction of your purchase and provide friendly, easy-to-reach support. WIDE DEVICE COMPATIBILITY: The cable is ideal for transmitting and converting digital signal from HDMI devices (Nintendo Switch, Notebook, PC, Laptop, DVD player, Roku, Chromebook, Chromecast, Amazon fire TV, PS3, TV box etc) to analog signal VGA devices(TV, Projector, Monitor etc). Please NOTE: This Cable is only for HDMI to VGA. Don't support Mac, Macbook, Mac Pro and Apple series product, Sony PS4 and Blue Player. SUPERIOR STABILITY: This HDMI to VGA Converter Cable has an Built-in Active IC Chip, it can convert digital HDMI signal to analog VGA signal directly, no external converter needed, just plug and play. COMPACT DESIGN: Gold-plated connector provide rigidity protection and excellent transmission performance; This HDMI cable is made of heavy duty material, high quality guaranteed. NOTE: Support ONLY one-way signal transmit and convert from HDMI to VGA, it is not reversible from VGA to HDMI. And The cable chip requires sufficient power from output HDMI port. We have tested this converter cable with most of the devices, it is not for use with Apple Mac systems and Blu-ray players. NOT compatible with all Apple devices [ Macbook Etc], Sony Devices [PS4] and Blu-ray players.